My sermon from the 4th Sunday of Advent (December 24, 2017) on Luke 1:26-38. Listen to the recording at the bottom of the page or read my manuscript below. Now, as Lutherans, I know we don’t usually spend a lot of time with Mary. Her appearances in scripture is limited so we don’t hear her voice very often in Sunday morning. We spend time with Mary usually only during this season – when it’s almost Christmas. We give her a voice in our Christmas pageants and in the carols we sing. We talk about her, about how she’s going to give birth in a barn, and we sort of downplay the rest of her 9 months of pregnancy. We place Mary in our nativity sets and creches, with her hands folded in prayer. But she sort of sits in the back, behind everyone else, behind even Jesus. We place her there and then just let her be. In many ways, we spend this Christmas season letting Mary be a passive participant in her own birth story. There are two other images of Mary that expand her story for me. And each one appears takes place while the baby inside Mary grows. The first one is this one, an image of Mary based on the song we just sang. She’s standing tall, her foot is crushing the serpent from the Garden of Eden, and she doesn’t look pregnant. Mary sings her song while visiting her cousin Elizabeth. Elizabeth is more than six months pregnant with her own son who will become John the Baptist. But while everyone knows Elizabeth is pregnant, Mary doesn’t yet show. 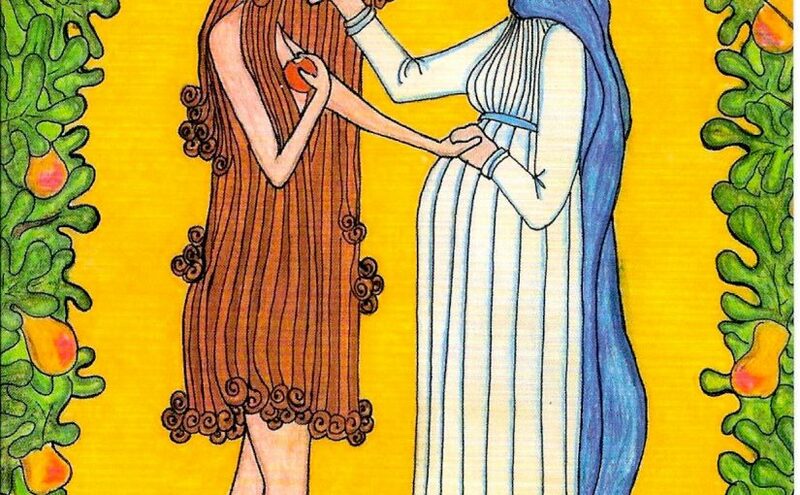 I imagine that Mary, in this moment, is in her first trimester. She’s in the part of her pregnancy where miscarriages are common. Mary can be quiet at this stage but she knows what’s going on. She knows what God is doing. And she sings about who God is, who God loves, and what God’s justice is all about. The second image is one I discovered recently, first created in 2003 by a Trappistine nun in Iowa. The image shows Mary when she is very pregnant. She can’t hide what’s going on anymore. But she doesn’t need to. Instead, she’s everything who she chooses to be – and she’s in this image, consoling Eve. Her foot again is on the head of the serpent because, through her, God is moving us past our sins. Her son, this Jesus, will be the one who will take this broken world and unite it with its creator. And this Messiah, this Savior, this king of all kings, is being nourished, carried, and cared for by this young woman who is someone that the people in Nazareth could not see as ever being the mother of God. In these last two images, Mary is exactly who she’s supposed to be: she knows who she carries inside her; she knows who God is; she knows that’ll she’ll be Jesus’ mom; and she chooses to be an active participant in what God is doing in the world. She doesn’t know the details about Jesus’ story – but she does know that, through Jesus, God is blessing the world. And God wanted Mary to be a necessary part of what God is bringing about.